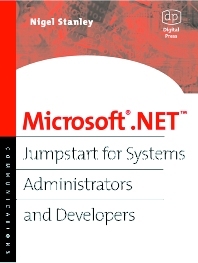 Microsoft .NET is born out of a personal search for the Holy Grail of .NET for IT professionals. Unlike competing texts, it focuses on actual implementation and management issues critical to the success of an enterprise. Through Nigel Stanley's active consulting practice, he has gathered essential information for integrating the far-ranging components which .NET touches without hype or superfluous programming details. Microsoft .NET revolutionizes the development, deployment and support of business applications. It introduces new technologies and concepts which have to be understood by today's IT professionals if they are to continue to be successful. · Clear coverage of all the major .NET Enterprise Server products · Introductions to important technologies such as SOAP, UDDI and XML · Experiences drawn from real life customer situations focusing on important need-to-know material for the IT professional · Appendix giving detailed specifications required to run the .NET Enterprise Servers. Nigel Stanley is Technical Director of a leading UK Microsoft partner. He leads a team of consultants and engineers providing business IT solutions, data warehouses, .NET training and consultancy. He previously worked for Microsoft, first as a systems engineer specializing in databases and developer technologies, and later as a product manager responsible for the Microsoft client server products. His first book, The SQL Server Handbook (Digital Press, 1995) covers Microsoft SQL Server in depth. The latest edition of the SQL Server Handbook for version 7.0 of SQL Server was released in June 1999.